How would you like a robot that can play pool, fold towels, and bring you a drink from the fridge? We'd like one too, but we don't want to spend $400,000 for the PR2 from Willow Garage. PR2 was built with high end components so that research on robotics software could progress in anticipation of ultra low cost components becoming available down the road. In many ways, that day has already arrived, as embodied by the $150 Kinect and the low-cost lidar used by the Neato robotic vacuum cleaner. These new sensors and other servos with feedback like the AX-12+ servos enable a personal robot with PR2-like capabilities to be within reach of a robotics club. Furthermore, the ROS software provides much of the intelligence and glue to make this goal a reality. This was the goal when we combined the resources and capabilities of four high school roboticists and their mentor fathers to produce PR Lite. After I started college, PR Lite was upgraded to a new robot called PR2 Lite. Read the latest updates at Matthew's blog! Also, PR Lite is featured in the December 2011 and August 2013 issues of Servo Magazine! As shown in the table below, the capabilities of PR Lite are analogous to those of PR2, but are lower quality. 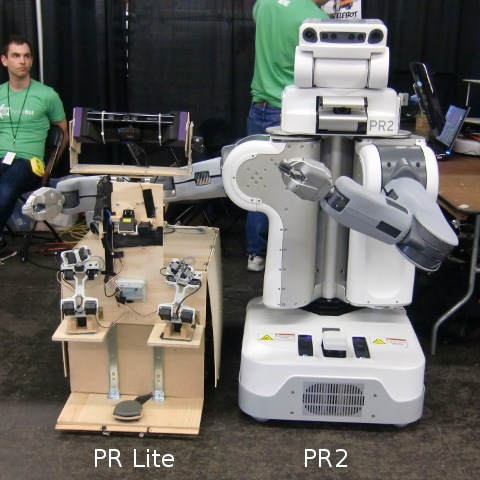 Our completed PR Lite prototype was demoed at RoboGames 2011, occupying the booth next to Willow Garage and PR2! Our demo featured PR Lite's arms mimicking a person's arms. A Kinect used the OpenNI library to find the subject's skeleton. This skeleton was transformed into spherical coordinates (with a radius), and inverse kinematics were used to position PR Lite's arms. The arms were made from the Bioloid comprehensive kit constructed to be similar to two Crustcrawler arms. 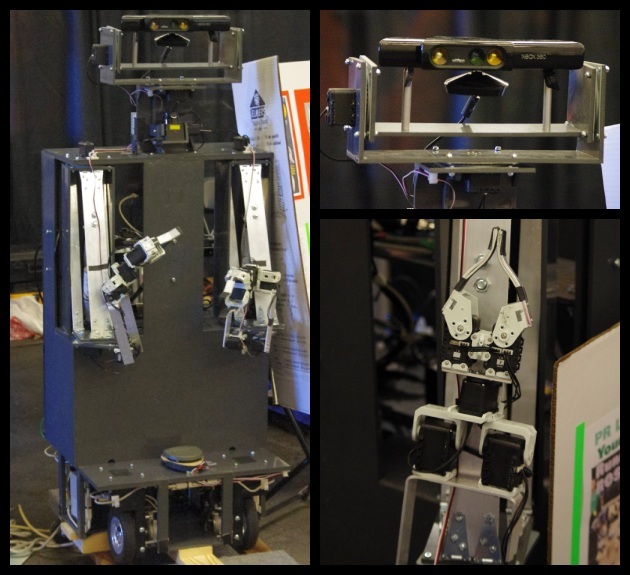 ROS packages from the University of Arizona were then used to control the arms. The initial PR Lite prototype was finished only barely in time for RoboGames. Many enhancements are planned to make PR Lite even more like PR2. We also want to harden the prototype against loose wires and bolts by fabricating some boards, and replacing many of the Bioloid construction kit parts with simple bent aluminum bars. 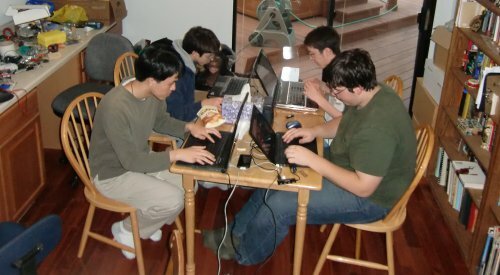 Most of all, we want to take advantage of our advanced capabilities by doing our own hackathons!